The photograph above shows a total of 12,345,678. 230 x 153 x 100 mm. (9" x 6" x 3.9"). 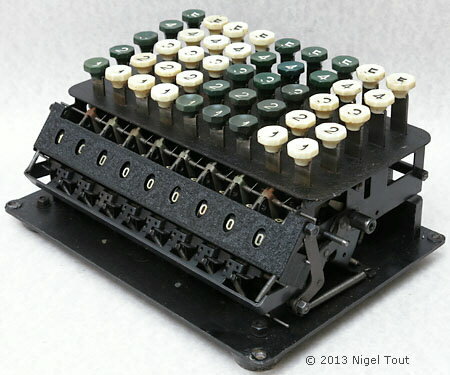 This is one of the first Bell Punch calculators, which were based on the Petters design that Bell Punch bought from that company in 1936. See the patents listed underneath the machine in the photograph below. 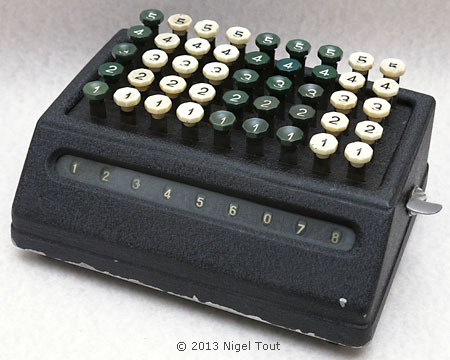 Firstly there is no trade name or manufacturer marked on the calculator but it has a Bell Punch model code and the patent numbers used by Bell Punch. Secondly, the plate on the bottom of the machine shows the original model type "S" scratched out and model type "D" substituted. So it appears that this machine was converted to a decimal type "D" from a type "S", for use with the old British £sd currency, maybe after the changeover to decimal currency in 1971. This sort of conversion was not uncommon. Close up of the plate on the bottom with the original model type "S" scratched out and model type "D" substituted. Apparently this machine was converted to a decimal type "D" from a type "S", for use with the old British £sd currency. 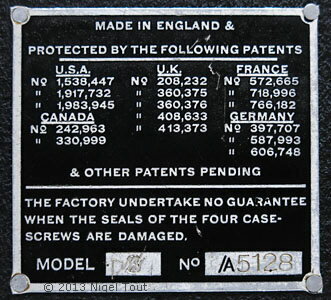 All of the U.K. patents listed on the plate were applied for byÂ Guy Bazeley Petter and Petters Limited of Westland Works, Yeovil, Somerset, from whom Bell Punch acquired them. Text & photographs copyright © 2002 - 2018 Nigel Tout, except where noted otherwise.